Whether school librarians are being pink slipped or not, it is always a very wise policy to build the parentsí understanding of what the school library does and how it helps every child in the school. This booklet, a companion to earlier titles for administrators and teachers, provides one-page messages directed at parents to examine the benefits of the school library. It provides hundreds of tips on how to help build readers, wise technology users, and information literates. 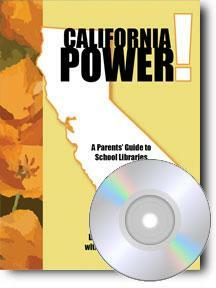 With a CD or book, each page can be duplicated as much as the librarian likes for the parents of a single school. Great for newsletters, parent awareness nights, mailings, workshops, and handouts to give visiting parents. The 53 pages cover the following general topics: An introduction to school libraries and the research done in each state, information literacy, technology, reading, and organizational ideas. Individual pages include topics such as: ï Why a professional school librarian? ï What information literacy is and how you can help as a parent ï Plagiarism ï Internet safety ï The digital school library ï Advice on reading to your child ï Reading awards programs ï Books too good to miss for children through teen years ï What to do about censorship ï Money matters and the school library ï No school librarian? What to do. ï How parent groups can help Wherever possible, individual focus has been added for each particular state. New individual state titles are being added on a regular basis.